Pyramyd Airsoft Blog: The VFC HK416 CQB, the hop-up & inner barrel therein, plus your mom. The VFC HK416 CQB, the hop-up & inner barrel therein, plus your mom. At least three of the four items mentioned in the title of the Pyramyd Airsoft Blog's latest entry will be discussed (the VFC HK416 CQB, its hop-up and inner barrel), the fourth will be thought of fondly and with the utmost respect at all times. That's what it looks like, chamber, bucking and all. If you lift your gaze just a smidge, towards the top of the image, you'll see that I've got a brand-spelunking new JBUnicorn Tight Bore Barrel, awaiting installation. I figured that since I had it available and whilst I had the HK416 in pieces, I may as well swap out the stock barrel for the upgraded one. Basically, it's like what Willy Shakespeare said in a sonnet once or something, "When in Rome, upgrade your Airsoft gun." When I originally ordered the JBUnicorn Tight Bore Barrel, I didn't really have a specific AEG in mind at the time, I just knew that I had several M4-style guns lyin around that needed to be, as my friend Tim at CQB Radio says, "Geeked Out." Fa sho. So this one, at 363mm, is a bit longer than the HK416 requires, so it will have to be cut down. So I made my mark based on the length of the stock barrel. 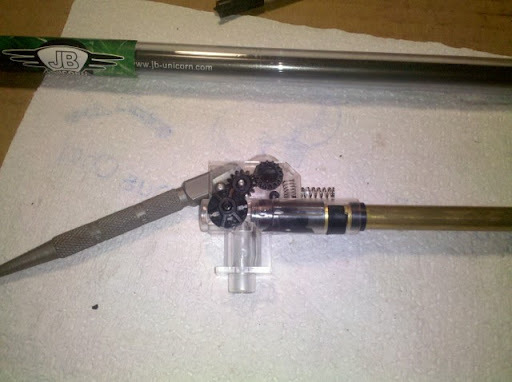 And yes, I totally used that razor to cut the barrel down. If I wasn't pressed for time, I would have take my Mitutoyo calipers and calculated the HK416 's cylinder volume and then used that to determine the exact length in mm that my barrel needs to be. You generally want a 2:1 ratio of cylinder volume to inner barrel volume. The operation was a success. The excess barrel length was severed and the cut was clean. 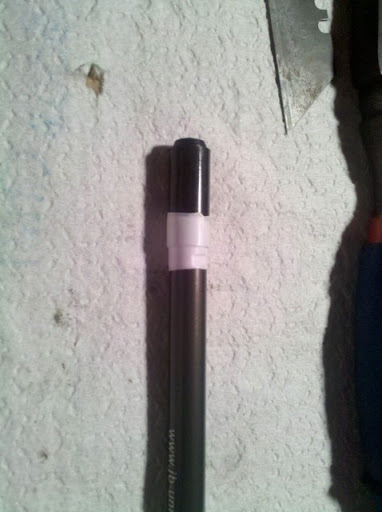 I used a specific Dremel bit I had in my "bit kit" to deburr the inside of the new tip and now we're good to go. 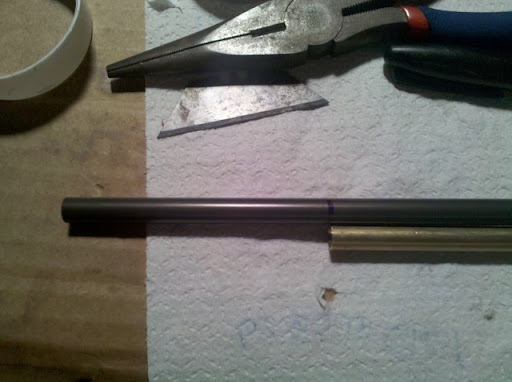 The JBUnicorn Tight Bore Barrel is now ready to get fitted with the hop-up unit. First things first. The bucking needs to be properly situated over the barrel and then sealed air-tight with Dupont's gift to the Airsoft tuner, aka Teflon tape. I did not photograph the process of checking the bucking to make sure it sits exactly right on the barrel, but basically, check out my diagram. That should give you clue on what to look for. That wasn't a typo. I purposely typed those random letters because I'm a 12 year old in a bald, 6'6" adult male body. Anyway, there's not much to the wrapping technique that I did there. Basically, I just pulled the tape tight to make it as flat as possible and wrapped the joint where air can escape between the end of the bucking and the outside of the barrel. You don't want to wrap the bucking too many times, otherwise you won't be able slide the hop-up chamber over it. Mission complete. Chamber reassembled and installed new tight bore barrel. I would like to address the elephant in the room now. 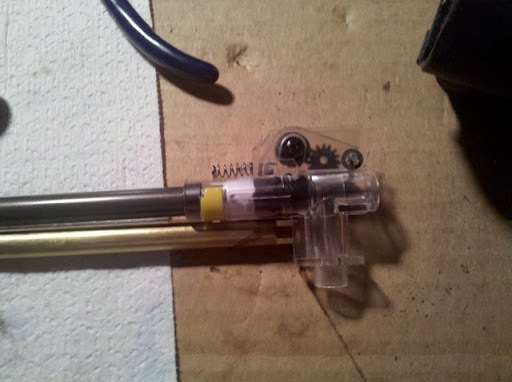 Clearly, that is NOT the original, black barrel clip that came with the hop-up, as pictured earlier. I snagged the yellow one off of another AEG that I am currently working on because that one is getting a whole new unit and therefore didn't need it. 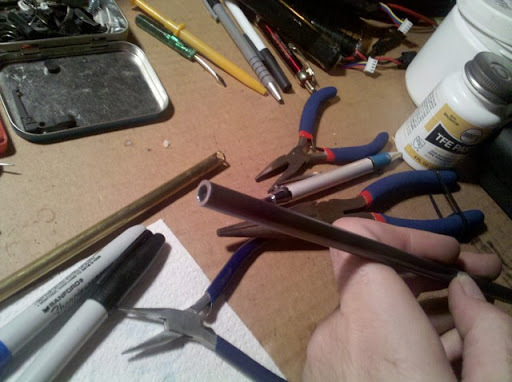 When I was attempting to remove the clip to swap out the barrels, the stupid thing popped off super quick, ricocheted off my desk lamp and flew into oblivion, never to be seen again. I concatenated a number of offensive swear words and verbalized them at loud decibels. Consequently, my wife came outside to advise me that it was almost midnight and the screaming of profanities should cease and desist immediately. The final step to this process was to install o-ring spacers around the outside of the JBUnicorn Tight Bore Barrel, adjacent to the hop-up unit so that when the barrel & hop-up assembly gets installed back into the outer barrel and upper receiver, the hop-up chamber will get pressed snuggly against the the gearbox, but not TOO snuggly that you can't fit all the body parts back together again, not unlike the unfortunate Humpty Dumpty incident of 1803. This should, in theory, help to provide a better seal for the air nozzle. I started with one spacer, slid the barrel assembly into the outer barrel/upper and determined that it wasn't going to be quite snug enough, so I added one more. YAHTZEE!!!!!!!!! 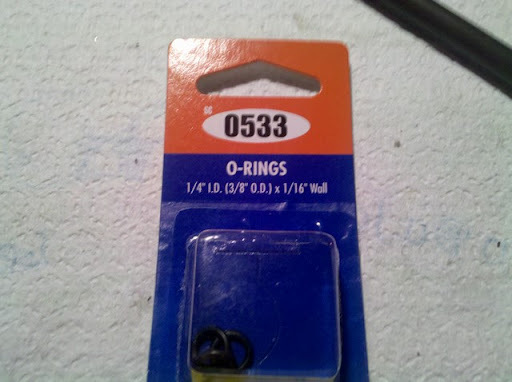 I have included the box that the o-rings came in for the purposes of helping you identify the dimensions of the o-rings that I used. 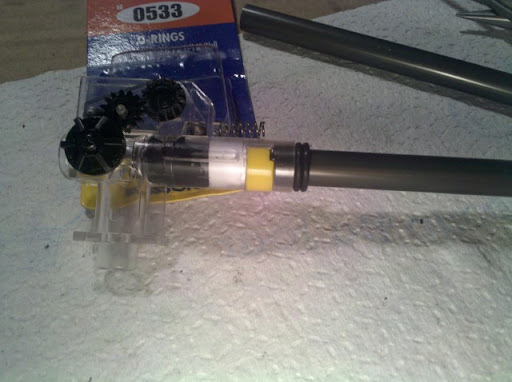 Here's what JBUnicorn Tight Bore Barrel looks like with the hop-up unit fully installed and seal, plus you can see what I was talking about regarding the o-ring spacers. So now, the VFC HK416 CQB is now ready to be reassembled and tested for accuracy and velocity. Stay tuned for the results. Hopefully we will see some improvement, otherwise, I will have to hang my head in shame and possibly slap myself across the face just prior to, or immediately following the hanging of my head.